Very happy with light output and pattern. Freuently ride a heavily tree lined MUT so a good light is important to me. No problem with mount as noted by other reviwers as of yet. The Taz 1200 is awesome! The Taz 1200 is an awesome light. It is super bright and compact, no separate battery pack and wires to mess with. I really like the wide beam pattern, with the Taz you truly only need one light. I ride with the Taz on my handlebars and no helmut light, where I ride there are a lot of switchbacks and there is no problem seeing around the next turn like with some narrower beam lights. I upgraded from an already bright 600 lumen to the Taz 1200 and what a difference. On the morning commutes cars actually do now pay attention and wait til I pass them. And on the training rides thru the wooded area I have now a much wider visual view. Both makes the riding in the early morning hours so much saver and enjoyable. And the fact that the Taz 1200 has an internal battery makes it even better. Love it! Super bright and easy to use, only problem I have is on really rough trails, slips on the big bumps, I'm talking the bumps that use my full suspension travel on my 140 mm fork. Looking for a better way to keep from slipping. I hate to slow down and one handed is not really an option when it slips, I also have a helmet light so I can still see, if this were the only light the slipping would be a huge problem. Light spread is excellent, oval shaped beam covers a wide angle on the trail. The strobe option needs a lower power setting, 400 lumens on the blink would be fine, 1200 is blinding to oncoming drivers. I commute an hour and a half each way to work. This light is super bright for the streets/bike path with no lights. 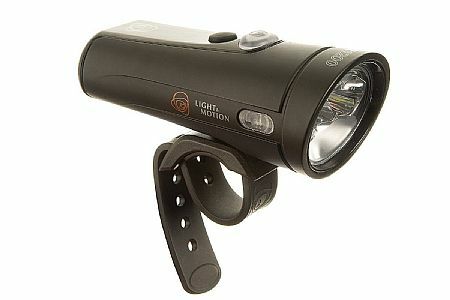 The Taz 1200 casts a consistent beam that provides full coverage of your surroundings. Because my commute is at the upper limit of the battery life on the high setting, I have to be conserve battery life by switching to a lower setting when there is street/ambient light. I purchased this light to increase my visibility to vehicles. With the number of people texting and simply not paying attention as they drive, I thought it was important to communicate my presence on the road with the high density flashing light mode offered with the Light & Motion Taz 1200. It's easy to charge and each charge lasts a long time. The instructions are clear and the controls are intuitive to use. Well built and worth the cost.